Mazda introduced this replacement for their discontinued Tribute model back in April of 2012, making the CX-5 one of the first 2013 model year offerings to debut. This petite crossover SUV is based on the Mazda 3 platform, with an additional 2.4 inches spliced into its 106.1 inch wheelbase. But its length of 178.1 inches is actually 2 inches shorter than the Mazda 3. 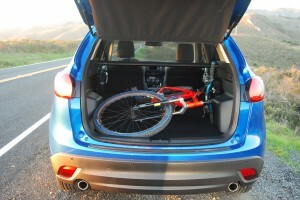 For such a short, compact SUV, the CX-5 is surprisingly efficient at accommodating bulky loads. I had no difficulty hoisting my mountain bike into the spacious rear cargo area created when by flattening the 40/20/40 folding rear seats. The hatchback loading floor is low enough to preclude hernias, and rear door actuation light enough to make closure pleasurable rather than painful. With the rear seat backs raised, aft passengers will find themselves with just enough leg and headroom to make short trips acceptable. 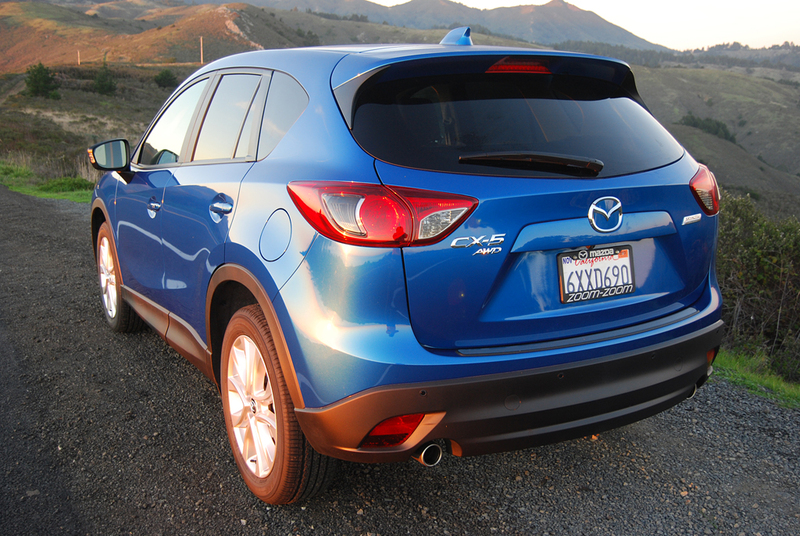 The rear of a CX-5, however, will not be your first choice for a 5 hour jaunt down Interstate 5. For that undertaking, you’ll want to sit up front, where Mazda has invested considerable attention to comfort and detail. For example, how many vehicles in this base price range ($28,595) offer heated driver and passenger seats as standard fitment? A 5.8 inch color display screen with rear facing camera is also part of the CX-5’s basic architecture. Likewise, a deafeningly loud Bose 9 speaker AM/FM/MP3/CD/SAT receiver is part of the base outfit here. The only extra cost option you might want to consider is the bargain-priced ($1,325) Grand Touring Tech Package, which not only adds Navigation to the infotainment mix, but also throws in adaptive, self-leveling headlights, a burglar alarm, and an advanced keyless entry system that unlocks the vehicle as you approach it. This GT Technology package is definitely prime value for the money. Mazdas have always been more fun to drive than the competition. In keeping with tradition, the handling of the CX-5 remains cutting edge. The elevated seating position allows you to see your apexes clearly when attacking a twisty piece of back road. The generously sized standard 19 inch alloy rims give full footprint to the all-season 225/55R19 Toyo A23 tires. Front and rear swaybars control body lean while independent front and rear suspension geometry maximizes the Toyo’s contact patch adhesion. Ride, however, is somewhat stiff and choppy because Mazda engineers favored handling over comfort when selecting spring rates and shock absorber settings. 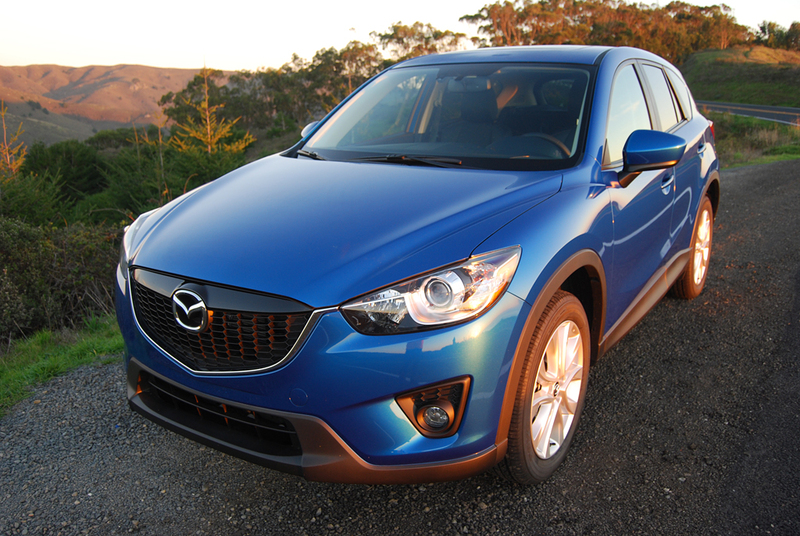 If there’s a single drawback to the CX-5, it lies under the hood. Unlike most engine compartments today, the CX-5’ sparkles with bright color and polished alloy bits. But these looks flatter to deceive. Despite the infusion of Skyactiv Technology used to develop this powerplant, its 155hp output is often insufficient to need. To keep pace with traffic, you’ll be forced to pedal this 2 liter straight 4 harder than you’d like. Determined effort to keep this fuel efficient four banger in its limited power band results in more noise than thrust. Even manually stirring the 6-speed automatic gearbox into action does little to improve straight line performance. But if you’re after stellar mileage, the Skyactiv engine gets the job done handily, posting 25MPG around town and 31 MPG on the freeway. The value equation here is loaded in favor of the CX-5. You get a smartly styled, practical, economic package for the money. But if you want real ZoomZoom, you’ll have to look elsewhere.